I’ve been wanting to learn Grails for sometime and finally had the time to try out this web application framework. Grails is a very impressive framework, it is really about productivity and simplicity. Some of the benefits are scaffolding, testing framework, easy to create plugin and seamless integration with Spring and Hibernate. 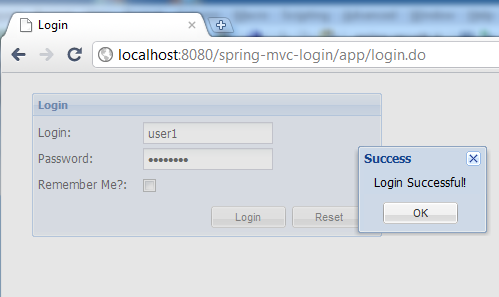 As part of my first attempt, I am customizing the Spring Security Login using ExtJS in a simple Grails application. The focus here is on the integration with Spring Security and ExtJS rather than Grails. I am using SpringSource Tool Suite (STS 2.7.1) to develop the demo application. The application is to display Quotes randomly and ability to maintain them. Let’s begin the integration and customization steps. Spring Security is not built-in Grails, to begin the integration execute the following Grails command. This step will create basic domain classes needed to store user information and the controller that handle the authentication. After executing the command below you will see several files being added to your project, such as LoginController, auth.gsp, denied.gsp, User, Role, UserRole, RequestMap. The domain class name for user and role is up to you to define and if you have an existing user domain, you must decide to integrate it (possibly by extending your domain class to the generated user class). Just a note that the RequestMap is an option and will look into it at later step. The need for this step depends on how you wants to control the access. You can use @Secured annotation to limit access to certain part of the application. In this example, I am not using annotation to limit the access, instead I define dynamics request maps which is shown in the Step 5. The following code is just an example of how @Secured can be used in the controller. The request maps class was generated in Step 2 and used to limit access by defining the access control at the URL. Here I create the request map in BootStrap.groovy for demo purpose, in your actual application this may be defined in configuration file or database. I don’t think you should choose between using annotation and request map. You can strike balance by implementing both to handle general and fine-grain access control. Amend related GSP (random.gsp) to ensure you have the login and logout link. Since I used scaffolding, I must install the templates and ensure the GSP templates are modified. Once scaffolding templates are installed, you will see the folders /src/templates/scaffolding/**. The files I modified in this sample application are create.gsp, edit.gsp, list.gsp & show.gsp. By now the integration is completed and if you used the test data in Step 10, you will be able to see the default login page. In order to customize it, copy the ExtJS source into /web-app and in this sample application I am using ExtJS 4.0.2. Start the customization by modifying the auth.gsp as shown below. Do take note on the naming of the fields as it is the convention used in Spring Security. window.location = homeUrl; //optionally this can be part of the data return by the server. The ExtJS login form will perform HTTP post to submit the login data however it expects JSON data as response. The default method in the LoginController will not be able to handle this, thus you must define your own handler. Add your handler into Config.groovy as shown below. The handlers are implemented in LoginController in the next step. After adding the handler, I suggest you remove or comment out the other methods to ensure they are not accessible. * Dependency injection for the authenticationTrustResolver. * Dependency injection for the springSecurityService. 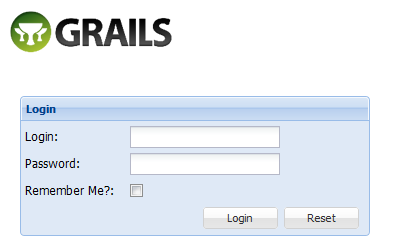 So, you have integrated your Grails application, customized the login form using ExtJS. Now, setup the test data in BootStrap.groovy and launch the application (http://localhost:8080/grails-qotd-extjs). Hope this tutorial helps and happy coding! implement login handler to return JSON. In order to activate the above configuration, you need to include the security context into the context parameter and include the security filter in web.xml. Those are the form fields needed for the Ext login form. The UsernamePasswordAuthenticationFilter watches for a request to the virtual URL (/j_spring_security_check) used for form-based authentication, and attempts to authenticate the user. If necessary, You can customize it to use your own controller to authenticate. 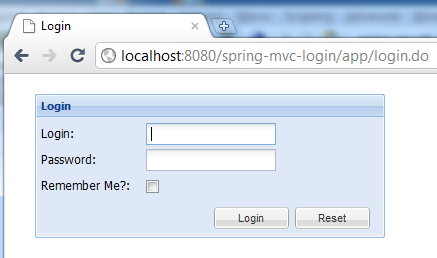 Take a look at the spring-mvc-login.js below. One thing to note is, this example redirect to a default URL upon successful login. It is done by modifying the window.location. Step 3: Implement login handler to return JSON. Remember the authentication handlers declared in applicationContext-security.xml? now you will need implement it to handle succcess and failure case. For this purpose I used Jackson JSON processor and to include it add the dependency to pom.xml. Time to test drive the code. Lauch http://localhost:8080/spring-mvc-login/ in the browser and you will be redirected to the login page http://localhost:8080/spring-mvc-login/app/login.do. Securing “remember me” using Token. Update: the source project is downloadable at myGit.